* Fixed a bug preventing addons from sending mail. * Fix missing surfaces and holes in Shal Korva dimension. * Quicksand Overlay dimension item may now be rotated. * Players who leave a guild can no longer see the guild chat channel. * All interrupts with attached Crowd Control effects now only apply their Crowd Control if an ability is successfully interrupted. * Burning Purpose now correctly affects all abilities with cast times. * Infuse Magic - Now heals for 25% less in PVP (up from 15% less). * Earthen Renewal - Now heals for 12% less in PVP (up from 5% less). * Telluric Burst - Now heals for 12% less in PVP (up from 5% less). * Earthen Barrier - Now heals for 10% less in PVP (up from 0%). * Frost Barrier - Now absorbs 10% less damage in PVP (up from 0%). * Crystal Barrier - Now absorbs 10% less damage in PVP (up from 0%). Frostkeeper's Armor - Now absorbs 10% less damage in PVP (up from 0%). * Font of Sublimination no longer interacts in unexpected ways with other cast time reductions. * Singed Spirit can now only trigger once every 35 seconds. The tooltip has been updated to reflect this. * Resilent Growth now can correctly crit. * Added a name to the buff that makes Skill Shot instant so it can be tracked by addons. * Call of the Forest now correctly affects all abilities with cast times. * Damage of Icy Burst reduced by roughly 10%. * Quest: The Enemy of My Enemy: It is now possible to turn this quest in near the original location specified in Tempest Bay without entering the Comet of Ahnket. * * Khadluu Ukher World Boss: Tyrant’s Roar damage has been lowered (previous was flat damage, now does percentage based damage of a player’s max health). * Refactored the abilities that the 5 Khan's use. The fights will be very different now, but should kill you less. This makes me sad. * Introduction Mode items that incorrectly required Abyssal Crusader's Accelerators to upgrade now require Broken Cosmoses. * Fyrangos: Fixed an issue with Fyragnos’ auto attack not being able to be blocked or dodged. * Fixed an issue causing Lord Arak to tell players they failed, even when they hadn’t…. yet. Perso, j'aurais préféré qu'ils up la sentinelle, elle me manque cette spé. La partie "controle" (en général un stun) ne s'applique QUE si une capacité a bien été interrompue. En clair gros nerf de tous les controles qui ont été pour la plupart jumelés avec les interruptions. PS: pour les pyro, commencez deja à privilegier la brulure à l'ardeur en pve. * Fixed some inconsistencies between displayed sale times on Welcome dialog and the Rift store. * Planar Attunement: The Wild Overgrowth planar attunement ability now correctly persists through death. * Devout Deflection talent now correctly increases guard. * The Seal of Impending Doom tooltip now correctly displays the base damage, and will also match the debuff tooltip on the target. * Scorch now correctly stuns when interrupting a target, if the Flash Burn talent is owned. * Font of Sublimination will no longer be consumed by casts that are already in progress. * Manifest Scorn will only target players and Surging Flame will no longer crit Azaphrentus. * Duke Eblius: Fixed Duke Eblius’ Fiery Strike from doing too much damage. * Lord Fionn: Ascended Odds will now correctly get reapplied with the correct number of stacks after a raid wipe. Fervor of the 5th will also be reapplied correctly as well. * Changed the Ancient Void Onir’s Utter Void ability to take 3 seconds to cast and be interruptible. Also reduced its frequency. * Fauxmire now resists being pulled out of the fightspace. * Picking up a Stormstone now causes the next Stormstone to appear after a delay. Turning in the Stormstone may decrease the delay. - La capacité [Utter void] de l'Onir du Vide ancien est maintenant moins fréquente, a 3 secondes de cast et on peut l'interrompre. - Ramasser une pierre de tempête ajoute un délai avant l'apparition d'une nouvelle. En reposer une réduit ce délai. * 50% Bonus Planar Attunment Experience. Log in this week and enjoy a little bit extra - you deserve it! * Five If By Sea: This quest now correctly appears in the Weekly category in the quest log. * Blast Wave now procs the Grounded buff that prevents a player target from being knocked back repeatedly. * Drown will now interrupt immediately on cast rather than waiting for the projectile to strike. * Windspear should now correctly interrupt as expected. 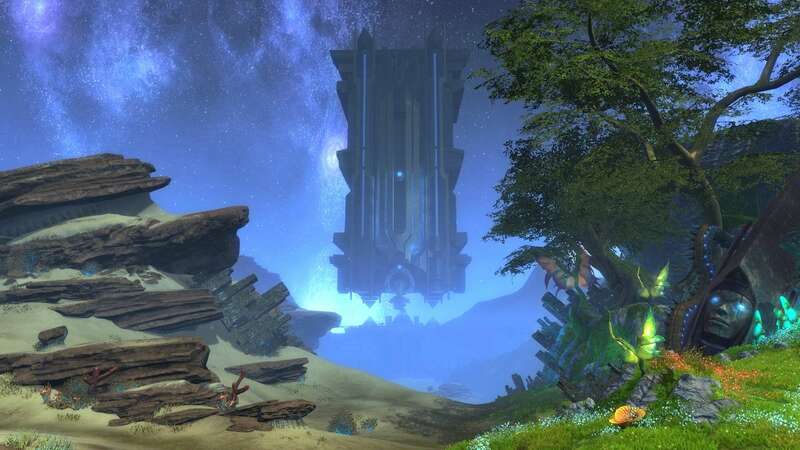 * Fixed the quest objective for Arisen Arak to appear after Lady Justice, Enigma and Dark Genesis have been killed. * Vis and Misericordia – Measures have been implemented to encourage players not to pull either boss from their tower perch. * Fixed an issue causing the Shield Break temporary ability to not be given to players. - L'objectif de quête pour Arak le revenant n'apparaîtra qu'une fois Dame Justice, L'énigme et la Génèse sombre auront été tués. - Des mesures ont été prises pour inciter les joueurs à ne plus sortir les Vis et Miséricordia de leur tour respective. - Correction d'un bug qui empêchait les joueurs d'avoir la capacité pour retirer les boucliers des boss. * Talent: Cold Front no longer grants speed to targets of the Frostkeeper’s Frost Barrier. Now, each time the Frostkeeper casts a heal spell, Cold Front increases the damage of the Frost Keeper’s next Hail Blast. * Fixed some missing Frostkeeper spell sounds. - Front froid ne donne plus de bonus de vitesse au joueur sous l'effet de la barrière de givre. A la place, à chaque fois que le gardegivre lance un sort, front froid augmente les dégâts du prochain déluge explosif. - Ajout de quelques sons manquants pour le gardegivre. Four souls are getting a face lift in 3.7: Warlord, Berserker, Druid and Elementalist! below are some brief blurbs, but be sure to check out the details in the SOULS section of the patch notes below! We wanted to make it into a brutal damage dealer that was every bit as good as its sibling, as well as providing a completely alternative playstyle. To accomplish this, we improved the “feel” of the abilities, while also making the choices about what power to use, and when, much clearer. Of course we needed to give it a bit of a boost as well; everyone likes to do more damage! Making the rotation of abilities more rewarding and fun to play was a central theme that traveled throughout or changes to this Soul. Our goal for Berserker was simple: we simply wanted to improve sustained damage over time. Berserker is still a Soul that can throw out a lot of damage in a very short period of time, but when its buffs are down it should now do better overall. Reducing Berserker’s reliance on abilities with a 1 minute cooldown was very important. as well as making the shift from Cunning to Fury feel more impactful and interesting. With a very versatile selection of abilities, Druid has always been popular for leveling and Instant Adventure. That same versatility always carried a price tag however, as Druid tended to be less effective in dungeons and raids. The new Druid has a much more active play style than before: several passive buttons or hour-long buffs were replaced with active abilities that reward precise management of several related stacks of debuffs on the target to maximize damage per second. Druids can now use the ability Conduit of Nature to gain one of four very powerful buffs. This allows Druids to get full benefit from their pet’s presence even in raid or PvP situations that might otherwise make the pet ineffective. The Elementalist was a great soul for leveling but fell off in high end play. We love Souls that utilize pets, but making the pets perform appropriately and intelligently in all environments is a major challenge. In difficult situations, the Elementalist will now be able to tap into the raw power of the planes through their pet, rendering it powerless for combat but providing massive benefit to its master. The specific power granted will depend on the elemental nature of the pet, anything from dramatically increasing the caster’s resistance to damage via Earth pets, to making spells from the Elementalist school instantaneous through Fire pets. Picking the right pet and utilizing its elemental nature effectively can turn the tide of previously difficult encounters! * Guilds can now be created by a single character. They no longer require multiple signatures to be created! * Guilds can now be created directly from the Guild Finder. * A fanfare now plays upon joining a guild. Congratulations! * New players will now be automatically added to a Starter Guild specific to their faction and server. This is meant to help introduce new players to the benefits of belonging to a guild in Rift while also connecting them with other newcomers. * New Player Guilds remain statically at level 5 and cannot gain Guild XP. * New Player Guilds always appear in the Guild Finder. * Players that have completed a particular dungeon five times will now become a Veteran of that dungeon. This status is not applied retroactively. * Veterans running a dungeon while grouped with at least one non-veteran gain a 15% bonus to currency, tokens, reputation, and XP earned from that particular run! * Summer is here and it’s time for fun in the sun! It begins on Thursday July 14th at 3:30 PM server time! * Artifact Piñatas containing seven new artifact sets can be found all throughout the world on during Summerfest. * These artifact sets are exclusive to Summerfest. * Destroying them causes an explosion of collectible artifacts to appear based on the color of the piñata when it explodes. * Collect all of the sets and you'll receive special dimension items, a title, and a rare pet! * New Burning Husk Mount and Beachtowel Cape. * New Outfits and Vanity Weapons: Alsbeth’s Raiment, Ruffian’s Garb, Short Oar, and Long Oar. *New Portrait Badges: Gold Scarab and Cupcake. * New Minion Card: Mitch and new Minion Adventures. * Dimension Key: Greenscale's Crater. * Dimension VFX: Bubbles, and Butterflies. * Dimension Items: Pastel Limestone Building Blocks and a new Summerfest Grab Bag! * Dimension NPCs: Waftwing Moth, Birds of Summer, Fish, and Wisps of Summer Flame. * 6 new Terrain Paint Recipes! * 21 new sets of EACH of the Poison, Burning, and Nightmare types of artifacts in both Stonefield and Gloamwood! Get exploring! * Corrected an issue where incorrect coin rewards were sometimes displayed for Quests. * Fixed a case where bags would auto close after using an ability or item in the inventory. * Missing localized words in some cases will have a new error message. * Fix an uncommon instability issue. * Bank Vaults have been fixed to allow extensions for all vaults. * Improved performance for those with very large friends lists. * Zone event announcements will now properly announce themselves to level chats again. * You can no longer fish to locations that you do not have line of sight of. * Fixed a strange case where characters could appear headless when they were inspected. * Sparkle quests are now even more specific about how you sparkle. * Fixed a bug where hair would overlay a helmet when previewing gear. * Introduction quests to various features of RIFT that are given automatically when you level can now be abandoned. * Fixed the display of some achievements which were no longer showing rewards. * Corrected display of some PVP and fishing achievements. * Added a scrollbar to the recent achievements summary. * Fixed non-giftable items to show as locked when viewing other player’s wish lists. * Raiment of the Torvan Order can now be purchased in the Rift store (Affinity > Costumes). * Fixed an issue with taking screenshots with UI while multicore rendering is enabled. * Further experimental multicore stability fixes. * The store button in the Soul Tree now correctly links to the Soul category in the store. * Fixed an issue where the Character sheet would sometimes show wardrobe overlapping armor after previewing items. * Added a new key bind for muting audio. * Fixed the drag area for greater essences in the Planar Focus. * Dormant Doom Guard Neck Band and Dormant Sigil of the Lost Goddess now upgrade to the appropriate item. * Items, like runes, or abilities, like Runebreak, that are used on other items, will dim all items which it cannot be used on. * The welcome dialog is now also accessible from the start menu. * Updated the split stack dialog to close when pressing Escape. * Fixed a bug when linking to the store from the crafting window, not showing the search item. * Adding a settings option to adjust the opacity for spell visual effects. * Added more details to the Affinity tooltip in the character sheet. * Artifacts window can now show artifacts sets that you have not yet started by using the drop down filter. The drop down “All” selection will now show not yet started artifacts. * Changed the way the Poison, Burning and Nightmare Artifact sight DOTs work to better accommodate lower levels as these types are now in Stonefield and Gloamwood. The damage per tick has been reduced, but Out of Combat health regen is suppressed while any of the DOTs are on you. * If a movement key is being held down when a root ends you will resume moving. * Call of the Ascended now correctly resets all combat resurrects when appropriate. * Updated ability tooltips to display cooldowns for contextual abilities. * Fading Light should work more consistently when under the effects of crowd control debuffs. * Fury of the Fae (level 28 root ability). * Aid of the Forest (level 36 root ability). * Spirit of Upheaval (level 44 root ability). * Spirit of Asphodel (level 50 root ability). * Subtlety (level 57 root ability). * Fast Summon – New level 28 root ability. Causes the next cleric pet summons to be cast instantly. * Nature's Censure – New level 36 - melee damage; off the GCD with an 8s cooldown. It deals bonus damage based on how many stacks of Natural Force are consumed. Stacks 1-4 increase the damage of Nature’s Censure by 10% each. 5 Stacks of Natural Force increase the damage of Nature’s Censure by 300%. * Nature's Edict – New level 36 root ability - melee damage; 4s cooldown. It consumes stacks of Nature's Force - replaces each stack of Nature's Force consumed with a stack of Nature's Weakness; Nature's Weakness increases all damage done by Druid soul abilities per stack. Stacks of Nature's Weakness last for 30s. - Seer - Increase range of the cleric’s melee attacks by 17m. * Mana Cost Reductions: The following abilities have had their mana costs reduced: Nature’s Edict, Fae Mimicry, Essence Strike, Fervent Strike. * Crushing Force – now deals attack damage on the initial hit; If this effect is on the target, the damage bonus from Nature's Edict effect is doubled. if a target is selected and is within 30m. Note that the ability can still be activated if no target is selected or if the target is out of range. Activating the ability in this manner will increase the damage of the next 4 druid abilities but will not apply Natural Force stacks to the target. Tooltip has been clarified to reflect this. * Shaman Massive Blow damage reduced by 15% in PvP situations. * Massive Blow is now unlocked as a root ability after 16 points have been spent in the Shaman soul. * Avalanche Strike is now unlocked as a root ability after 8 points have been spent in the Shaman soul. * Archon's Bulwark buffs now have unique names for each element to improve addon tracking. * * Mana Drain has been removed from the following Abilities: Mana Wrench, Mass Betrayal, Traitorous Influence, and Transference. * Cycle of Elements: Talent: Passive: Every 10 seconds you will advance to a new element. Cycle of Elements increases the damage of the appropriate element by 5/10%. * Crystalline Missiles now deals Physical damage and is modified by your current Elemental Cycle. - Cycle of Earth: Your Crystalline Missile deals additional Earth damage and has increased critical chance. - Cycle of Air: Your Crystalline Missile deals additional Air damage and chains to another target. - Cycle of Water: Your Crystalline Missile deals additional Water damage and heals you and nearby allies. - Cycle of Fire: Your Crystalline Missile deals additional Fire damage and is instant cast and has a 1 second global cooldown. * Elemental Burst: Counts as all elements and will trigger all 4 Cycle of Elements buffs. * Prismatic Volley: Counts as all 4 elements and will trigger all 4 cycle of elements each tick. * Stormbolt: Now also triggers Air and Water cycles. Cooldown increased to 25s. Damage adjusted to account for this. * Volcanic Eruption: Now also triggers Fire and Earth cycles. Cooldown increased to 25. Damage adjusted to account for this. * Raging Elements: Also increases the Mage's damage by 50%. * New Ability: Conduit of Power: 58: Your Greater pets becomes an elemental foci, providing you a buff and no longer attacking. Each pet provides a unique buff. Can only be cast if you currently have a Greater Elemental out. Dismissing your pet will remove this buff. - Earth Elemental: The mage now takes 15% less damage. - Air Elemental: Spell Power is increased by 10% and damage dealt by 25%. - Water Elemental: Cooldowns of damaging and control spells are reduced by 15%. - Fire Elemental: Elementalist Cast times are reduced to 0. Channeled spells deal 15% more damage. * Prismatic Volley damage drastically increased. * Elemental Burst damage drastically increased. * Stormbolt damage drastically increased. * Volcanic Eruption damage drastically increased. * Talent: Rushing Wind: Reduces the cast time of Lightning Strike by .75s per point. * Intensify Elements now has a 60 seconds cooldown (down from 120s). * Frostkeepers can now correctly cast any barrier on a target that is already affected by another Frostkeeper’s barrier without removing the other Frostkeeper’s effects. *Fixed an issue where Ground Zero was causing Frostkeeper’s Armor to proc on the target of Ground Zero. * Frozen Ground is now correctly tagged as both a snare and a stun when the appropriate effects are applied. * Earthen Rapport's absorb no longer incorrectly benefits from effects that increase absorbs. * Harmony is now correctly considerd a proc and will no longer trigger certain effects incorrectly. * Earthwalk can now be properly used while under the effect of crowd control debuffs. * Rending Slash now increases damage by 10% (up from 8%). * Rising Storm now increases effectivenes of SP contribution by 5% per point (up from 4%). * Pyromania now increases the effect of Spell Power on your Fire abilities by 4% per point (up from 3% per point). * Fireball now applies a damage over time effect for roughly 30% of its damage over 2 seconds when both Fusillade and Heat Wave are on cooldown and not currently in effect. * Scorch now correctly stuns when interrupting a target (if the Flash Burn talent is owned). Atrophy still gains damage as its duration runs, but the amount of increase has been reduced. * Icefall/Corpsefall: Now a single button called Wrathfall. Becomes Corpsefall in Cunning. Becomes Icefall in Fury. * Corpsefall: Only used in Cunning. Deals single target damage to the target and increases the damage they take from Underworld Shards. Corpsefall also heals the Berserker for X. Pushes towards Cunning. * Icefall: Only used in Fury. Deals AoE damage split evenly among up to 8 targets. Deals increased damage for each target hit. Targets hit by Icefall are snared for 5 seconds. Pushes towards Fury. * New Ability: Shatterfrost: Deal AoE damge split evenly among up to 8 targets. Deals increased damage for each target hit. Deals bonus damage to targets who have been recently damaged by Icefall. * Damage of Creeping Doom increased by ~17%. * Damage of Icefall increased by ~17%. * Damage of Corpsefall increased by ~40%. * Damage of Underworld Shards increased by ~17%. * Damage of Spirit's Wrath reduced by ~10%. * Planar Spout now increases damage by 10% (down from 15%). * Font of Wrath now increases AoE damage by 3% per stack. * Chilling Wrath now increases the effect of Font of Wrath by 3% per point. * Condensed Wrath now increases damage by 15% per combo point. The penalty per target is 20% per additional target beyond the first. * Condensed Wrath only works on Berserker abilities. * Deathly Tendrils damage increased by 25%. * Residual Pain now deals roughly twice as much damage. * Thunderhead effect now displays the correct effect name, icon, and effect percent when applied to the Dervish. * Font of Sublimination is no longer consumed by effects that are already instant at the time you get a proc. * Excoriate damage reduced by 5%. * Vaporize damage reduced by 5%. * Allies who stand in your Serenity receive 50% increased healing from your Deluge and Estuary. * Life Bond's Teleport can no longer be activated by players who are carrying an objective in PVP. * kill Shot will now only consume Font of Sublimination and Skill Shot procs one at a time, rather than both at once. * Mana Drain has been removed from Touch of Darkness. Rapid Fire Shot deals roughly 10% more damage. Rapid Fire Shot damage in PVP remains unchanged. Calculated Shot deals roughly 12.5% more damage. Calculated Shot damage in PVP remains unchanged. Deadeye Shot deals roughly 10% more damage. Deadeye Shot damage in PVP remains unchanged. Sentry Battery deals roughly 8% more damage. Sentry Battery damage in PVP remains unchanged. * Mirrored Strike, Shadow Flurry, and Strangulate are now correctly tagged as death damage. * Seeping Darkness now can correctly be used when under all forms of CC. * Seeping Darkness no longer provides immunity to CC after being cast. * Fixed some missing sounds on the Shadeborn soul. * Shadow Flurry damage reduced by 5%. * Consuming Depths damage reduced by 5%. * New (Level 4) Light's Shield: Taking damage has a 30% chance to apply Light's Shield. Retaliation, Light's Reprisal, and Light's Vengeance require stacks of Light's Shield to be cast. This effect can only be triggered once every 3 seconds. *Retaliation: Now also increases your Block Mitigation by 30% for 12 seconds. Now requires Light's * Shield to be cast instead of triggering after a block. * Light's Reprisal: Now requires Light's Shield to be cast instead of triggering after a block. * Light's Vengeance: Now requires Light's Shield to be cast instead of triggering after a block. * Aggressive Block: Tooltip clarified to no longer reference abilities that come after a block. Now references abilities that require Light's Shield. * Mana Drain has been removed from Storm Burst. * I Believe in You! Has been reworked to provide a portion of your Attack Power as an absorb when Stand Tall! Heals a target. * Surges are now passives that are applied for 10 seconds when a finisher is cast. * Power costs reduced by 25% across the board. * Defensive Surge no longer reduces damage dealt. * Offensive Surge now works as described in the tooltip again. * Piercing Thrust is now only buffed after a warlord finisher. * Ready Posture now increases critical hit damage by 10% (up from 5%). * Ready Posture now reduces Power costs of abilities by 10% (up from 5%). * Surges now only trigger from Warlord finishers. * Piercing Thrust now deals 200% increased damage when used after a Warlord finisher. * Ready Posture increases the damage bonus by 150% (up to 350%). * Nightmare Saga: Thanks to nstgc, Researcher Jessa is no longer scared off by Defilers’ Beacons of Despair during the quest Finding the Finder. * The dwarves of the Runic Athenaeum have built a porticulum on the Timeworn Cliffs. * Instant Adventure: Featured Queue: Summer is here! Enjoy a vacation to sunny Shimmersand and the balmy jungles of Dendrome. * Khadluu Ukher World Boss: The initial damage of Fiery Discharge done after being hit by the projectile has been lowered. Tyrant’s Roar damage has been lowered. Previously it dealt flat damage, now does percentage based damage of a player’s max health. * The Water Twisted Skyhunter no longer has a continuous knockback aura. And then there was much rejoicing. Huzzah! * Diolixis the Mage Lord has taken a up residence in Tempest Bay to critique your fake fights against the training dummies. * Instant Adventure: Encroaching Earth: The adventure has been rebuilt with better messaging and more appropriate respawn rates for the motes. * Laethys: Laethys will no longer cast “Storm of Treasures”. * Fixed a bug where VO would play upon zone in even after bosses have died. *Fixed an issue on Easy Mode where sometimes players would continue to gain stacks of Ascended Odds after respawning and not engaging an enemy. * The entrance to the Comet of Ankhet raid has been move to (13278, 11564) just outside of the Haunted Terminal building. * Garau’s Bloodtide ability is now interruptible. * Fixed a bug where Arisen Arak would continue to shout VO after he died. * Moved the exit location of the instance so you’re no longer in the line of fire. * Threngar’s Consuming Darkness is no longer modified by the amount of mana he has. * The Rhaza’de Canyon Conqueror achievement no longer requires the achievement Kill them All to complete. * Fixed a bug where the ‘conqueror’ achievement was named rapid assault. * Vis and Misericordia: Measures have been implemented to encourage players not to pull either boss from their tower perch! * Lord Arak: Fixed an issue causing the Shield Break temporary ability to not be given to players. * Pagura now breaks off all attacks when transitioning to the second phase of the encounter. * Crustok and Brachy’s Defensive Blast now hits for less damage. * PVP Damage reduced by roughly 25%. * PVP Healing and Absorbs reduced by roughly 20%. * Weekly quests have been changed so that the favor they reward can be augmented by favor boosts. * Ascended has been changed so that it will only count kills inside of Warfronts. * Conquest Carnage now only requires 900 kills to complete. * Minion Adventures you receive from Zephyr should no longer proc as rare. * Reaper’s Blade and Huntsman’s Waraxe have had their item level reduced to be in line with all other drops from CoA. * The Shovel of Progress now unlocks its wardrobe appearance. * All Chocolate Horse Bridles are now eligible for Underwater Mount Training. * The Raiment of the Torvan Order wardrobe set can be found in the Affinity store. * Added 20 more wardrobe slots for all your costuming needs! Character view now shows the equipped wardrobe items instead of the real ones. * Weapon rune VFX effects now show up properly when applied to the wardrobe slot. * Dead Simon punching dummy now available for your Dimensions from your local Lucky Coin merchant. * Building block shapes missing from various material sets have been added to the game. * Plushie dimension items can now be found in the Small Decorations section of the Auction House. * Fixed a bug where the dimensions dialog would incorrectly show active dimensions after replacing a dimension. * The Building Blocks and Modules section of the Rift Store has been reorganized. * Carpet Tiles have been added to the Building Modules section of the Rift Store (Dimensions > Building Modules). * Three new types of Brick Building Blocks (Red, Gray, and Dark) have been added to the Rift Store (Dimensions > Building Blocks). * Three new types of Wood Building Blocks (Dark, Oak, and Mahogany) have been added to the Rift Store (Dimensions > Building Blocks). * Three new types of Painted Wood Building Blocks (Black, White, Grey, Orange, Pink, Purple, Yellow) have been added to the Rift Store (Dimensions > Building Blocks). * Five new types of Roofing Building Blocks (Blue Tile, Brown Shingle, Tin Sheet, Grey Scale, and Green Scale) have been added to the Rift Store (Dimensions > Building Blocks). * Added a recipe for Monument Base to the Rift store and Bob in Choreburg. * Monument of Reason, Monument of Judgement, and Chancel Globe can now be purchased in the Rift store (Affinity > Dimensions). * Bundles of Water or Glass Building Blocks can now be purchased in the Rift store (Affinity > Dimensions). - Les guildes peuvent désormais être créées par un personnage seul. - Les guildes peuvent être créées depuis l'outil de recherche de guilde. - Les nouveaux joueurs intégreront automatiquement une guilde d'introduction, spécifique à leur faction et leur serveur. Cela permet de présenter le concept de guilde, leurs bonus, et à rapprocher les nouveaux joueurs les uns des autres. - La guilde d'introduction est et restera toujours de niveau 5, et ne gagne pas d'XP de guilde. - La guilde d'introduction apparaît toujours dans l'outil de recherche de guilde. - Les joueurs qui finissent 5 fois un donjon A PARTIR DE LA MISE A JOUR deviennent vétérans de ce donjon. - Un vétéran groupé avec un non vétéran gagne 15% d'XP, de monnaies et de réputation pour le donjon. - Des pinatas d'artefacts, qui contiennent des artefacts provenant de 7 nouveaux sets d'artefacts, propres au festival d'été. - Lorsqu'une pinata est détruite, elle explose et des artefacts ramassables apparaissent, de la couleur de la pinata. Voilà pour la partie 1, je traduirai la partie 2 ce soir, une fois de retour chez moi. - Il n'est plus possible de pêcher sans ligne de vue sur là où l'on lance la ligne. - Correction d'un bug étrange qui faisait disparaître la tête de certains joueurs lorsqu'ils étaient inspectés. - Correction d'un bug qui faisait parfois apparaître les cheveux ET le casque lorsqu'on examinait une tenue. - Il est maintenant possible d'abandonner des quêtes d'introduction. - Correction de l'affichage de certains hauts faits de PvP et de pêche. - lorsque l'on regarde la liste de souhaits d'un autre joueur, les objets que l'on ne peut pas offrir sont marqués comme tels. - le bouton boutique dans l'arbre des âmes mène maintenant bien à la catégorie Âmes de la boutique. - Les objets comme les runes/orbes ou les capacités comme briseur de rune ou récupération d'armure vont griser tous les objets sur lesquels on ne peut pas les utiliser. - La fenêtre de division des tas d'objets se referme lorsqu'on appuie sur echap. - Correction d'un bug qui empêchait parfois le lien vers la boutique depuis la fenêtre d'artisanat de fonctionner. - Ajout d'un filtre dans la fenêtre d'artefacts pour afficher les collections que l'on n'a pas commencées. - changement du système de dot des artefacts poison, brûlure et cauchemar : le dot est plus faible, mais la vie ne se régénère plus. - Ajout d'aventures instantanées de l'event d'été au Rhizome. - Réduction des dégâts infligés par certains Khans des étendues marquées par les plans. - Ajout d'un PNJ à baie de la tempête pour "critiquer vous simulacres de combats contre les petits qui s'entraînent. - Correction d'une aventure parmi les aventures instantanées du Rhizome. - Correction d'un bug qui faisait se lancer des dialogues même si tous les boss étaient morts. - La capacité [Bloodtide] (marée de sang ?) de l'inquisiteur Garau peut maintenant être interrompue. - Correction d'un bug qui permettait à Arak de toujours parler même après sa mort. - L'objectif "tuer arak le revenant n'apparaîtra qu'une fois Dame Justice, l'Enigme et la genèse sombre tuées. - La capacité de Threngar [consuming darkness] n'est plus modifiée par le mana qu'il lui reste. - Correction du bug qui nommait le haut fait Conquérant "Assaut rapide". - Correction des hauts faits L'Approche sparte et Allez-y, maudissez mon trésor. - Dans les aventures à Glasmarteau, la capacité [Bloodtide] (marée de sang ?) de l'inquisiteur Garau peut maintenant être interrompue. - Dans les aventures à l'esprit de la folie, des mesures ont été prises pour inciter les joueurs à ne pas faire descendre Vis et Misericordia de leurs tours respectives. - Les quêtes hebdomadaires ont été changées pour que la faveur obtenue puisse être augmentée avec des boosts de faveur. - La quête Carnage d'élu a été changée pour ne comptabiliser que les morts en champ de bataille. - Le carnage de conquête ne nécessite plus que 900 morts. - Les aventures reçues par Zéphyr ne seront plus toutes des rares (= payantes en crédits). - La pelle du progrès débloque bien son apparence dans les tenues. - Diminution des stats de plusieurs essences. - De nouvelles montures peuvent devenir amphibies. - Ajout de 20 emplacements de tenue (j'en connais une qui va aimer). - La fenêtre de personnage montre maintenant la tenue, et non l'équipement. - Les effets sur les armes apparaîtront correctement dans la fenêtre de tenue. - Correction d'un bug qui indiquait parfois les mauvaises dimensions actives. - La partie "blocs de construction" de la boutique a été réarrangée. - Ajout d'une recette d'objet dimensionnel, [Monument base]. - Des packs de blocs de construction eau et verre sont disponibles dans la boutique, dans la partie affinité. Et pour ce qui est de la traduction des changements pour les âmes, je m'en occuperai demain matin (jeudi), j'ai besoin d'une pause. Retrouver les noms français des capacités est assez long, je vais donc faire classe par classe. - Si une touche de déplacement est maintenue lorsqu'une immobilisation finit, on se re-déplace immédiatement. - Le reset du délai de récupération des résurrections de combat de l'appel des élus fonctionne maintenant correctement. - Force naturelle (capacité passive en racine de niveau 36) ; les attaques au corps-à-corps ajoutent un stack de Force naturelle à la cible, en plus de leurs effets de base. - Blâme de la nature (capacité en racine de niveau 36) ; capacité de corps-à-corps, hors GCD et avec un CD de 8s, inflige des dégâts bonus dépendant du nombre de stacks de Force naturelle sur la cible (10%par stack pour 1 à 4 stacks, et 300% pour 5 satcks) - IMPORTANT : il est écrit 300% sur la patchnote, et pourtant en jeu on peut lire 200% sur le tooltip. Il faudrait faire des tests pour trancher. - Décret de la nature (capacité en racine de niveau 44) ; capacité de corps-à-corps, 4s de CD, consomme tous les stacks de Force naturelle et les remplace par des stacks de faiblesse naturelle, les capacités de druide du clerc infligent 3% de dégâts supplémentaires par stack de Faiblesse naturelle. - Le regen mana rapporte maintenant 10% de mana (contre 7% jusqu'à présent) et consomme toujours 7% de la vie ; a un CD de 5s. - Mimétisme féérique ne concerne plus que les capacités de druide, a ses dégâts réduits à 70% des dégâts initiaux (contre 100% jusqu'à présent), et applique 5 stacks de force naturelle à la cible (si une cible est sélectionnée et à moins de 30m). - Coup massif est désormais une capacité en racine de niveau 16, et frappe d'avalanche une capacité en racine de niveau 8. - Coup massif inflige des dégâts supplémentaires basés sur la statistique de sort critique du clerc. - Le buff du rempart d'archonte a maintenant un nom unique pour chacue élément, pour que les addons puissent le traquer plus facilement. - Intention brûlante touche bien toutes les capacités incantées. - Le drain de mana a été retiré des capacités suivantes : Déchirement de mana, Trahison massive, Influence traîtresse et Transfert. - Orbe de Nyx n'a plus de CD, et ses dégâts ont été réajustés en conséquence. - Nouveau passif, le cycle des éléments : toutes les 10 secondes, le mage passe à un nouvel élément. Les dégâts infligés par l'élément correspondant à l'élément actuel sont augmentés de 5 à 10%. - Terre : inflige des dégâts de terre supplémentaires, fortes chances qu'il soit critique. - Air : inflige des dégâts d'air supplémentaires, et riccoche sur une autre cible. - Eau : inflige des dégâts d'eau supplémentaires et soigne les alliés à proximité. - Feu : inflige des dégâts de feu supplémentaires, est instantané et n'a qu'une seconde de GCD. - Explosion élémentaire compte comme une attaque des 4 éléments et active les buffs des 4 états élémentaires. - Volée prismatique compte comme une attaque des 4 éléments et active les buffs des 4 états élémentaires à chaque tick. - Eclair foudroyant active les buffs d'air et d'eau. Son CD a été monté à 25 secondes, et ses dégâts ont été adaptés en conséquence. - Eruption volcanique active les buffs de terre et de feu. Son CD a été monté à 25 secondes, et ses dégâts ont été adaptés en conséquence. - Eléments déchaînés augmente en plus les dégâts du mage de 50%. - élémentaire de terre : le mage subit 15% de dégâts en moins. - élémentaire d'air : la puissance des sorts est augmentée de 10%, et les dégâts infligés sont augmentés de 25%. - élémentaire d'eau : le CD des capacités de dégât ou de contrôle est réduit de 15%. - élémentaire de feu : le temps d'incantation de l'élémentaliste est baissé à 0, et ses capacités canalisées infligent 15% de dégâts supplémentaires. - Le CD d'Eléments intensifiés a été baissé à 1 minute (contre 2 minutes jusqu'à présent). - Il est maintenant possible à un gardegivre de placer une barrière sur une cible qui a déjà une barrière d'un autre gardegivre, sans en retirer les effets. - Correction d'un bug qui faisait parfois apparaitre le proc l'armure de gardegivre sur une cible de Rasement. - Entaille déchirante augmente les dégâts du mage de 10% (contre 8% jusqu'à présent). - Boule de feu inflige 30% de ses dégâts en plus pendant 2s si Fusillade ET vague de chaleur sont en CD. - Ardeur étourdit correctement la cible si elle se fait interrompre, et si le talent correspondant est débloqué. - Atrophie a toujours ses dégâts augmentés au fil du temps, mais l'augmentation des dégâts a été réduite. - Augmentation de 15% des dégâts de Contact obscur. - Augmentation de 15% des dégâts de Souillure. Je recopie ici les changements du primaliste ; vu le temps que prennent les traductions, je sauterai celle-là, d'autant qu'aucun membre de la guilde ne joue primaliste comme classe principale. - le drain de mana a été retiré de Contact des ténèbres. - Tir magistral inflige 10% de dégâts en plus en PvE (inchangé pour le PvP). - Attaque de factionnaire inflige 8% de dégâts en plus en PvE (inchangé pour le PvP). - Frappe reflétée, Déluge d'ombre et Etranglement sont maintenant marquées comme des capacités infligeant des dégâts de mort. - Ténèbres suintantes peut être utilisé contre tout effet de contrôle. - Une fois lancé, Ténèbres suintantes n'apporte plus d'immunité aux effets de contrôle. - Ajout de Bouclier de lumière au niveau 4. Subir des dégâts donne 30% de chances d'appliquer bouclier de lumière (une fois toutes les 3 secondes maximum). Rétribution, Représailles de lumière et Vengeance de lumière nécessitent un stack de bouclier de lumière pour être lancé. - Rétribution augmente également la modération de blocage de 30% pendant 12 secondes. - Correction de la description du Blocage agressif pour mentionner des capacités utilisant Bouclier de lumière (et non lancées après un blocage). - Le drain de mana a été retiré d'Explosion d'orage. - Les poussées sont désormais des passifs qui sont appliqués pendant 10s lorsqu'une attaque finale est effectuée. - Réduction de 25% du cout en énergie de toutes les capacités. - Poussée défensive ne réduit plus les dégâts subis. - Poussée offensive fonctionne à nouveau comme indiqué dans sa description. - Poussée perforante a ses dégâts augmentés de 350% si elle est utilisée après une attaque finale (contre 200% jusqu'à présent). - Posture prête augmente les coups critiques de 10% (contre 5% jusqu'à présent). - Posture prête réduit le coût en énergie des capacités de 10% (contre 5% jusqu'à présent). * Claim your Summerfest Friendship Gift in the RIFT Store, available now through August 5th! Each gift contains 40 Affinity, 125 Summerfest Merit Badges, 1 Summerfest Friendship Bracelet and a 3 Day Patron Pass, claimable once per account. Thanks for your patience during the downtime last week! * Artifact Piñatas will no longer allow you to pick up the Artifacts unless you were an appropriate level (or mentored level) when the Piñata died. It must be green or higher to you, or else you will not be able to pick up Artifacts or get loot in your Rift bag. * Artifacts from piñatas will no longer prompt a need/greed roll regardless of loot settings. * In an effort to curb the extinction of the local swarmlord population, the achievement “Bug Juice” no longer requires 300 kills of Swarmlord Khargroth. 1 seems sufficient. * Little Shiny no longer makes any noise. Hopefully his remaining forms of communication are still intact. * Thundersmack is now available to all callings. Get this player-named weapon while you can! * Fixed an issue when purchasing tokens and vouchers. * Fixed a crash that could occur relating to the Captain Dagon minion. * Fixed an issue with the intro movie causing a client crash on startup. * Pressing enter while attempting to buy partial stacks or split stacks in the inventory will now function correctly. * Fixed a crash when trail-type particle effects are triggered. * Fixed an issue that could result in Faith's Reward being removed when another Cleric casts Overflowing Renewal on you. * The Precision Inscribing talent now affects Rune of Soul Binding and no longer affects Rune of Smiting. Runestrike and Inscribe Fate are still affected by the talent. * PVP: Massive Blow damage reduced by 20% in pvp environments. * PVP: Break Free now works as expected again. * Frozen Ground now properly applies immunity after stunning a player. * Infuse Magic now heals for 67% less in PVP. * Weekly Quest: Aquias Avenger: This quest is now correctly listed in the Weekly section of the quest log. * Have the Prophecies of Ananke come to pass? Will they be fulfilled? Why are there imps all over Tempest Bay? Do you have a few moments to talk about Aia, the goddess of fate? * Lord Fionn now has a chance of dropping a warrior one-hand weapon with the Ethereal Ascension activated ability. - N'oubliez pas votre cadeau, à récupérer en boutique (pour plus d'informations, voir le post d'Atys à ce sujet). - Il est obligatoire, pour ramasser des artefacts de pinata, d'avoir au maximum 7 niveaux de plus que la pinata (que son niveau apparaisse en rouge, orange, jaune ou vert, mais pas en gris). - Il n'y a plus de besoin/cupidité qui apparait lorsqu'un artefact de pinata est ramassé alors que l'on est en groupe. - Dans un effort pour limiter l'extinction de la majorité des espèces des marais, le haut fait 'Jus d'insecte' ne nécessite plus de tuer 300 insectes du seigneur de l'essaim Khargroth. Un seul semble suffisant. - Petit brillant ne fait plus de bruit. - Foudroiement est désormais disponible pour toutes les classes. - Appuyer sur entrée lorsqu'on tente de diviser un tas ou d'acheter un tas d'objets fonctionne correctement. - Correction d'un bug qui faisait disparaitre vos stacks de récompense de foi si un autre clerc lançait renouveau luxuriant sur vous. - Le talent Inscriptions précises n'affecte plus rune de frappe ferme, mais Rune de lien d'âme à la place. Les autres runes restent inchangées. - Les dégâts de Coup massif sont réduits de 20% en PvP. - Réduction de 67% des soins d'Infusion de magie. - La quête Vengeur d'Aquias est maintenant rangée dans la section des quêtes hebdomadaires. - Les révélations d'Ananke seront-elles oubliées ? Se révèleront-elles exactes ? Pourquoi y a-t-il des diablotins à Baie de la Tempête ? Avez-vous un moment pour parler d'Aïa, la déesse du destin ? - Seigneur Fibon a une chance de donner une arme à une main pour guerrier avec la capacité [Ethereal Ascension] activée. * Weapons: Reduced the hit rating of the Thundersmack Conker. * Weapons: The hit rating of the intermediate Thundersmack Basher is now in line with the other weapons. * Added Visible Phase Icon on artifact Piñatas to aid colorblind people. * Quest: Estranged Brew: The item Lenny’s Finest is no longer a unique item. - Note: It will not stack due to technical limitations with how charged items work. * All Normal, Twisted, Unstable, Poison, Burning and Nightmare Artifacts no longer pop up the Need/Greed Window. * Fixed the Guild Finder from constantly closing. * Using abilities and items when using the inventory search will no longer clear out the current text search. * Ember Watch forge no longer sells items for Infernal Marks of Ascension. * A character who is a member of a starter guild and who switches factions during the game is automatically added to the appropriate starter guild of their new faction. * Fixed an issue with the Shadow of C’zyth getting in a state where he would not attack. * Threngar: The damage from Consuming Darkness has been severely lowered. * * AFK players are now more effectively removed from matches. * The recipe for Cosmic Bags now creates a non-bound box that contains a Cosmic Bag. The Cosmic Bag Box can be traded with other players. * The ground paint effect has been removed from the following dimension items: Star Flower, Closed Star Flower, Firepetal, Tentacled Firepetal, Firepetal Stalk, Firepetal Clump, Lifespreading Podflower, Death Spine Group. - La précision de l'arme de l'event non améliorée est ajustée pour coller avec les autres armes. - Ajout d'une icône sur les pinatas qui indiquent leur phase actuelle pour aider les daltoniens. - La bière-récompense de la chasse de Morban n'est plus un objet unique. Elle ne se stack toujours pas, en raison des limitations dues au fonctionnement des objets à charge. - Correction de la fenêtre de recherche de guilde qui se fermait sans cesse. - Utiliser une compétence ou un objet lorsque l'on utilise la fonction de recherche dans les sacs n'effacera plus le recherche en cours. - La forge du guet de braise ne vend plus d'objets contre des marques d’ascension infernale. - Un joueur membre d'une guilde de départ qui change de faction est automatiquement intégré à la guilde de départ de sa nouvelle faction. - Correction d'un bug qui mettait parfois l'Ombre de C'zyth dans un état où il n'attaquait plus. - Les dégâts de [consuming darkness] dans le combat contre Threngar ont été largement baissés. - Les joueurs absents sont plus efficacement retirés du champ de bataille. - La recette pour le sac cosmique permet de fabriquer un objet non lié au compte dans lequel se trouve un sac cosmique, afin de permettre aux joueurs de les échanger. - Les objets suivants ne sont plus affectés par les peintures de terrain : bourrache, bourrache non éclose, massif de pétale de feu, pied de pétale de feu, pétale de feu plantée, pétale de feu à tentacule et pétale de feu. * Trophy items can now be purchased from Odi Rovan in The Canals of Tempest Bay. * Tower Sigils and similar upgrade components can no longer be Runebroken. * Improved stability of in-game experience when a user’s character is a member of a starter guild. * Reclaim Elements now only heals you for 25% of your Maximum HP in PVP. - Les trophées peuvent maintenant être achetés auprès d'Odi Rovan dans les canaux de Baie de la Tempête. - Les sigils de la tour et autres objets du même genre (composants d'amélioration) ne peuvent plus se faire désenchanter avec Brise-rune. - Amélioration de la stabilité du jeu lorsque le joueur fait partie d'une guilde de départ. - Récupération des éléments ne soigne plus que de 25% de la vie maximale du mage en PvP. * Due to the issues with Starfall Prophecy tokens last week, we’ve added a one time claimable reward in the RIFT Store, Package of Prophecies, that contains 5 bonus tokens. Sorry for the inconvenience! * Fixed a memory leak that caused server instability. * Fixed art issues with some armor for all dwarves and female bahmis. * Players in starter guilds remain in the same guild when they hop shards. * Rogue Synergy Crystals no longer appear when filtering by Warrior or Primalist. * The option to purchased Earring Slots and Planewalker: Water for Voidstones has returned! Both can be purchased for 50,000 Voidstones each. * The time limit to purchase the RIFT: Essentials Edition has been removed. It can be found in the RIFT Store under the DLC category. * Massive Blow now receives roughly 33% less benefit from Spell Crit when calculating bonus damage. * Rending Slash now causes the target to take 15% more damage from the Mage (up from 10%). * Primal Avatar: Wind Serpent now increases damage dealt by 25% and lasts 20s. * Wind at your Back now increases Air damage by 15%. * Might of the Earth now grants 2% WD and AP per point (down from 4%). * Shearing Winds now deals 105% of your Weapon Damage per point (up from 80%). * Seismic Smash now increases the damage of Air Cutter casts by 35% (up from 20%). * Subduction cooldown is reduced to 4 seconds (down from 6) on a target below 35% HP. * Font of Sublimination will no longer be consumed by Scald if it is already instant when you gain the Font effect. * Storm Strength now grants 2% WD and AP per point (down from 4%). * Primal Avater: Drake now affects 7 abilities. * Heart of the Volcano now increases Earth and Fire damage by 30%. * Furious Power now grants 2% WD and AP per point (down from 4%). * Greater Salvo now increases the damage of your Vorpal Salvo by 15% per point (up from 10%). * Moment of Brilliance now increases the damage of Stroke of Brilliance when Fury and Cunning are equal by 40% per point (up from 25%). * Infusion now causes an additional 12% damage as Ethereal (up from 10%). * Shadow Twin now causes 35% of the damage dealt as Ethereal (Down from 40%). * Light’s Shield now has a 60% chance to proc and a 2s cooldown. * Light's Decree - Projectile now moves roughly 50% faster. * Life's Rapture has been removed. * NEW: Sanctuary - Replaces Life's Rapture. Ground Placed zone where all incoming damage is greatly reduced. Zone lasts up to 4 seconds or until the Paladin ceases channeling. Cannot move while channeling. * NEW: Wall of Light - Moving Channel. Allies who stand in a cone behind you take substantially less damage. Requires a stack of Light's Shield. * NEW: Purify Land - Place a powerful zone that erupts after 1 second, dealing heavy damage and incredible threat to all targets in the area. * NEW: Call of the Divine - Enemies in the target area are teleported to you. Requires one stack of Light's Shield. * Strike Like Iron now increases damage by 30% (up from 25%). * Shifting Blades now affects 4 attacks (up from 3). * Shatter now grants 2% damage per point (up from 1%). * Deadly Posture now increases Crit Chance by 12% (up from 10%). * Surges can no longer be improperly purged. * Fading Light is no longer incorrectly locked out by certain control effects. * Fading Light and Resilient Hide (Primalist) no longer incorrectly appear in the general tab of your spellbook. They are now correctly listed with other Ascended Powers. * Have you heard the revelations of Ananke? The Tempest Bay Chamber of Commerce has passed regulations limiting proselytizing imps to only speak once every 25 minutes rather than once every 25 seconds. * Hericius: The invisible waves cease to exist once Hericius enters the Shroomageddon. * Sicaron: The achievement ‘Contractual Obligation’ now requires you to defeat Sicaron in 25 contracts or fewer up from 20 contracts or fewer. This change will not grant the achievement retroactively, so if you have defeated Sicaron with fewer than 25 contracts in the past, you will have to do so again to earn the achievement! - The Shadow of C’zyth will no longer rotate and follow its current target during Wrath of C’zyth. - The duration of Wrath of C’zyth and Weight of Worlds has been increased by one second. - The cooldown period for Wrath of C’zyth and Weight of Worlds has been increased by two seconds. - Inversion should now properly display and affect players as before. * Frozen Horror Tights are now spelled correctly. * Fixed a typo in the description of the Snaggletooth companion pet. - Les cristaux de synergie pour voleur n'apparaissent plus lorsqu'on filtre pour ne voir que les cristaux pour guerrier ou primaliste. - Bouclier de lumière (Light's Shield) a 60% de chances de s'activer et a un délai de 2s. - Le projectile de Décret de lumière est 50% plus rapide. - Ajout d'une capacité remplaçant Extase de la vie : Mur de lumière, une canalisation (pendant laquelle il est possible de bouger). Les alliés qui se trouvent dans son cône d'effet subissent moins de dégâts. Nécessite un stack de Bouclier de lumière. - Ajout d'une nouvelle capacité : Terre purifiée, une aoe qui s'active après 1s, infligeant beaucoup de dégâts et générant une menace très importante. - Ajout d'une nouvelle capacité : Appel du divin, qui téléporte les ennemis situés dans la zone sélectionnée jusqu'au guerrier. Nécessite un stack de bouclier de lumière. - Frappe de fer augment les dégâts de 30% (contre 25% jusqu'à présent). - Lames changeantes affecte maintenant 4 attaques (contre 3 jusqu'à présent). - Brisement augmente les dégâts de 2% par point investi (contre 1% jusqu'à présent). - Posture mortelle augment les dégâts infligés de 12% (contre 10% jusqu'à présent). - Les poussées ne peuvent plus être purgées. - à Baie de la tempête, les farfadets ne parleront plus que toutes les 25 minutes, au lieu de toutes les 25 secondes. Dans le combat contre Hericius, les vagues disparaissent une fois que le boss passe dans sa dernière phase (la phase où il faut tuer les trois champignons). Lors du combat contre Sicaron, le haut fait Obligation contractuelle est maintenant donné aux joueurs tuant Sicaron en 25 contrats ou moins (contre 20 ou moins jusqu'à présent). * The Level 40 Boost bundle now gives the correct size Ascended Pouch. Players with the old Pouches now own limited edition collector’s items. Congratulations! * Fixed an issue where players’ guild tag would show up incorrectly when in the Starter Guild. * Call of the Divine can no longer incorrectly affect entities that are immune to teleports or knockbacks. * Primalists completing the quest Servants of Twyl can now claim a two-handed mace as a reward. - Le trésor d'élu de niveau 40 donne désormais une bourse d'élu de la bonne taille. Les joueurs qui avaient l'ancienne bourse d'élu sont maintenant en possession d'un objet en édition limitée, félicitations ! - Correction d'un bug qui faisait parfois apparaître de manière incorrecte le nom de guilde pour les joueurs faisant partie d'une guilde de départ. - Appel du divin ne fonctionne plus sur les créatures ou objets insensibles aux téléportations et déplacements. - Les primalistes qui finissent la quête Serviteurs de Twyl à Bois d'argent peuvent choisir une masse à deux mains comme récompense de quête. * Saboteur has been completely rebuilt from the ground up as a 3 target cleave/AoE spec. - Many abilities have been pruned and/or reworked completely. - Charges have been changed to a personal resource that are used to cast Sticky Bombs. - Sticky Bombs are triggered by the Detonate ability (and Satchel Charge if talented). - Several reactives have been added to improve gameplay readability in general. * Replaced the activated abilities on Rogue daggers from Lord Fionn with passive abilities. * Fixed an issue that allowed some items with activated abilities to be triggered when not equipped. * The Warmonger’s Charm will no longer trigger damage to players taking damage from Intercede. - Les joueurs faisant partie d'une guilde de départ resteront dans la même guilde lorsqu'ils sautent d'un serveur à un autre. - Les dégâts infligés par un Charme du belliciste ne peuvent plus être interceptés par la capacité Intercession. - Les capacités actives des dagues voleur récupérées après avoir battu Fibon sont remplacées par des capacités passives. - Correction d'un bug qui permettait d'activer des capacités liées à une pièce d'équipement alors qu'elle n'était pas équipée. * Fixed a bug where the current zone for a character that joins a starter guild Is listed as ‘Unknown’. * Hunt Rift: Quest: As the Planarch Commands: Infused Planarch Glyph will no longer continue to drop once the quest has been completed. * Entropic Veil now only affects Chloromancer healing. * Lifebound Veil no longer incorrectly triggers Natural Awareness. * Lifegiving Veil no longer incorrectly triggers Natural Awareness. * Entropic Veil no longer incorrectly triggers Natural Awareness. * Symbiosis no longer incorrectly triggers Natural Awareness. * Scattered Flurry now correctly scales with talent points. It is now applied on impact rather than on detonation. * Saboteurs now no longer incorrectly consume other Sabotuer’s sticky bombs. * We Stand United! now requires 18 points. * Catch Your Breath! now requires 6 points. * Maelforge: The Tritium Core achievement reward no longer does damage or knocks back players. * Due to the removal of mana drain, the achievement “Brain Drain” has now been moved to a Legacy achievement. - Correction d'un bug qui indiquait que les joueurs rejoignant une guilde de départ étaient dans le zone "Unknown". - Voile entropique n'impacte plus que les soins prodigués. - Voile vivifiant, voile de biosyndesmos, voile entropique et Symbiose ne déclenchent plus Conscience naturelle. - Correction sur les bombes collantes/grenades (je ne sais toujours pas quelle a été la traduction). - L'union fait la force ! requiert maintenant 18 points investis dans l'âme. - Retenez votre souffle ! requiert maintenant 6 points investis dans l'âme. La récompense de haut-fait Noyau de tritium n'inflige plus de dégâts aux joueurs et ne les repousse plus. Comme le drain de mana a été retiré, le haut-fait Fuite de cerveaux est passé dans la catégorie Héritage. * Instant adventure groups in an Intrepid instant adventure are assigned to a new adventure after they finish final quest in the adventure chain. * Fixed a bug that would prevent advancement in the Caldwelddi puzzle chain. * The Vengeful Curio’s damage effect is no longer triggered by auto-attacks, items, or procced effects. * Fixed a bug where the Protector’s Crystal was not giving the appropriate amount of guard radius. - Correction d'un bug qui empêchait d'avancer dans la chaîne d'énigmes de Caldwelddi. - Les dégâts des broutilles de Curiosité vengeresse ne sont plus déclenchés par les attaques automatiques, les objets ou les procs. - Correction d'un bug qui donnait au cristal de protecteur une mauvaise augmentation du rayon de la garde. Many of you are getting close to being able to own Opie, and now Planar Pellets will now be available to harvest or purchase! Any harvest node of any type will have a chance of yielding some pellets. You can also visit your local Artifact collector if you wish to purchase them for either lucky coins or credits. Pellets will also be tradeable, so be sure to check your local auction house too! * The Twisted Krillado in Sky Fishery will no longer try to hide inside rocks. * Hammerknell – Fixed some of Matron Zamira’s abilities so they are unable to be reflected. * Mind of Madness – Fixed some Arisen Arak abilities so they are unable to be reflected. * The Defiler has received a facelift, including updates to Aggressive Avarice and how it interacts with Greed stacks, increased damage over time across the board, and more. Check it out! * The Alaviax devils now know how to correctly spell their own names. * Arisen Arak will not respawn on a soft reset of the instance. Nombre d'entre vous pourront bientôt obtenir Opie, et les [planar pellets] (ce qui est nécessaire pour utiliser les capacités d'Opie) sont maintenant récupérables lors de la récolte de matériaux d'artisanat et disponibles à l'achat. Tout type de récolte, quel qu’en soit le métier, a une chance d'octroyer des [pellets]. Vous pouvez également aller voir un collecteur d'artefacts si vous voulez les acheter en pièces porte-bonheur ou en crédits. Les [pellets] seront échangeables, donc pensez à vérifier également l'hôtel des ventes. - Les Krillados altérés de la pêcherie céleste, dans les étendues marquées par les plans, vont enfin cesser de se cacher dans des rochers. - Correction de certaines capacités de la matrone Zamira dans l'aventure à Glasmarteau, qui ne sont désormais plus sensibles aux capacités de renvoi de sort. - Correction de certaines capacités d'Arak le revenant dans l'aventure à l'Esprit de la folie, qui ne sont désormais plus sensibles aux capacités de renvoi de sort. - L'âme de profanateur s'est refait une beauté, avec entre autres une augmentation des dégâts infligés. - Les démons Alaviax dans la Comète d'Ahnket savent désormais correctement écrire leur nom. - Arak le revenant ne reviendra plus après un soft reset de l'instance.